Discover convenience like never before by incorporating Wine By Your Side Stainless Steel Ice Bucket into your dining experiences in a variety of settings. The unique design clears space on the table for food and avoids overcrowding. Wine By Your Side is an innovative luxury revolutionizing how people dine. 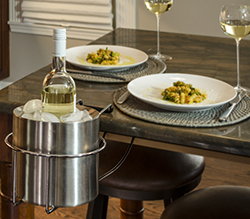 Discover convenience like never before by incorporating Wine By Your Side Stainless Steel Ice Bucket into your dining experiences in a variety of settings. Pair the ice bucket with the Wine By Your Side Chrome Plated Wine Holder to experience the utmost convenience when dining. The solution to having a relaxed and uninterrupted dinner is easy and the result is outstanding. Make the next meal a memorable one by adding Wine By Your Side to immediately enhance overall dining experience.